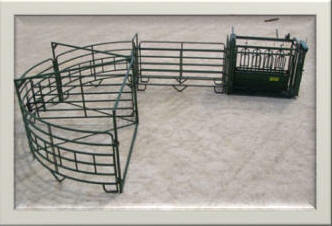 150' x 250' Utility Roping Arena with Return $5400, 150' x 250' Heavy Duty Roping Arena with Return $7500. The tub has three curved sections 10’ long, 5’6” tall made of 14 gauge 1 ½” square tubing with six bars. The crowd gate is 10’ long. Each section of the straight alley is 10’ long and made of 1 ½” square tubing, 14 gauge with six bars. The alley is 28” wide inside and is non-adjustable. 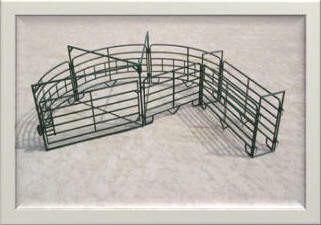 Arches are made of 1 ½” schedule 40 pipe. Approximate weight is 1300 lbs.